This flyer announced the forthcoming series of "ōnishiki" (大錦) to be based on articles in the newspaper "Tōkyō nichinichi shinbun" (東京日日新聞). The title of the nishikie series, however, was 東京日々新聞 (Tōkyō nichinichi shinbun). In other words, the 東京日日新聞大錦 were titled 東京日々新聞. Here, and throughout this website, the "Tokyo nichinichi shinbun" newspaper is referred to as Tōnichi, and the "Tokyo nichinichi shinbun" nishikie is called TNS. See the Articles, Galleries, and Media sections for details on Tōnichi and TNS. See the Crime, Suicide, Society, and Politics sections for TNS stories. The cherub on the left is looking down and to his left -- at the text if not at the other cherub. The cherub on the right is looking to his right -- apparently at the text. On this print, the cherubs are holding a newsprint cleverly folded to divide the provided information into writer and publisher particulars. On prints in the TNS series, both cherubs holding an unfurled banner showing the title of the series and the issue number. For a look at differences in the posturing of the cherubs on the prints in the TNS series, see TNS two series, four stages. 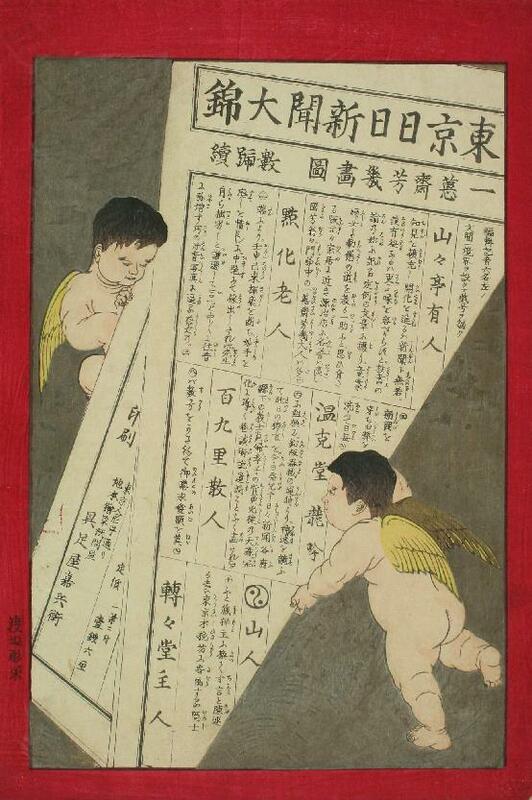 This print announces the publication of an "onishiki" (large nishiki) bas of the broadsheet Tokyo nichinichi shinbun. Prominently billed under the banner is the name of the drawer, Ikkeisai Yoshiiku. Following his name is a notice that "a number of issues will follow in succession" (Ono 1972:9 tosses this phrase around a bit). The names of the six men who will write the stories are conspicuously featured with the text. They are sprinkled through the text without any relationship to the blocks of text that follow. The first and last listed are the most important. Sansantei Arindo was the gesaku writer Jono Denpei, one of the founders of Tonichi -- or "Nichinichi shinbun" as the paper is referred to in the text. Sansantei had known both Yoshiiku and Yoshitoshi for years, having worked with them on prints or story books, and was one of several gesaku writers who went on to become journalists. Jono signed 11 TNS stories, making him the third most frequently named writer in the series, after Tentendo Shujin (48) and Onokudo Ryugin (13). Tenka Rojin and Ha Sanjin each signed two stories, but Hyakkuri Sanjin signed only one. Nothing is known about Tenka Rojin or Hyakkuri Sanjin -- nor about Ha Sanjin, except that the character for the "Ha" is represented by a heraldic design. The character is also read "tomoe" -- a comma-like mark used in a number of heraldic designs. Ha Sanjin used a variation of the "futatsudomoe" mark -- two commas united in a circle, reminiscent of a Yin-Yang sign -- in his signature, as in Married after death. Read more about tomoe on JAANUS. Onkokudo Ryugin signed 13 TNS stories, which made him the second most frequently attributed writer for the series, far fewer than Tentendo Shujin (48), and only a couple of more than Sansantei Arindo (11). See Dramatis persona for more details about this writer. Tentendo Shujin was the gesaku writer Takabatake Ransen. Of the 88 TNS stories that were signed, he signed 48, hence more than all other writers combined. He also used the greatest variety of names. See the article "Dramatis Persona" for more details about these variations and how he used them. Three signatures not listed on this promotional print appear one time each on TNS stories. Rogetsutei Ayahiko (弄月亭綾彦), which appears on TNS-40, was another pen name of Jono Denpei, aka Sansantei Arindo, aka Rogetsutei Arindo, among other monikers. Katei Otoko (霞亭乙湖), which appears on TNS-885, seems to have been the penname of Nishida Densuke, one of the founders of the Tonichi with Jono, Hirooka, and Yoshiiku. Shosan (松山), on TNS-9005, was the drawer Hayakawa Shosan, which may have been another name of Seisai Yoshimura. On the back of the fold, in the lower-left corner, is the name and location of the publisher, Gusokuya Kahee, on Ningyocho dori. Just to the right of the publisher's information is the price: 1-sen 6-rin (0.016 yen) per sheet. How much was this then? How much would it be today? "Onishiki" (大錦 Oonishiki, Ōnishiki) was the common name for the larger nishikie, which were printed on a sheet of washi of the larger oban (大判 ooban, ōban) size. Oban sheets were roughly 38-40 x 26-27 centimeters, but the actual prints turned out to be around 35-37 x 23-25 centimeters, or about the size of a sheet of B4 paper today (25.0 x 35.3 centimters). Most Edo/Tokyo nishikie were printed in this size. The third and forth lines of the first large block of text, to the left of Sansantei Arindo (山々亭有人), contain the following text (furigana are show in parentheses). This means "to teach the path of encourgement and chastisment [moral judgment] to children and women" (dōmō fujo ni kanchō no michi o oshiyuru), and was one of professed objectives of the Tokyo nichinichi shinbun nishikie. A similar appeal appears in the inaugural issue of its Yubin hochi shinbun counterpart.